Information is only as valuable as one's ability to access it. There is a wealth of information about your compounding practice held in The Compounder. PK Software's new Data Mining module helps you unlock that information and present it in a way that can help you grow your compounding practice efficiently and quickly. The Data Mining module gives you a window into your compounding history like you've never seen before. Want to know what Doctors have started prescribing your formulas in the past three months? Want to know which formulas are have lost popularity over the past year? Want to know which doctors are really generating profits for your Pharmacy? What are the top chemicals used? Which pharmacists are compounding the majority of your most popular formulas? These questions and hundreds more just like them are answered with the Data Mining Module. As a pharmacist or pharmacy owner, you're probably aware of the major trends that affect your pharmacy and your market. But what about the less obvious trends that might be having a big impact on your bottom line? Are competitors affecting your business or are doctors just out of touch? Using the Data Mining Module will show you real numbers - not anecdotal presumptions. Data Grouping: Flexible levels of detail. 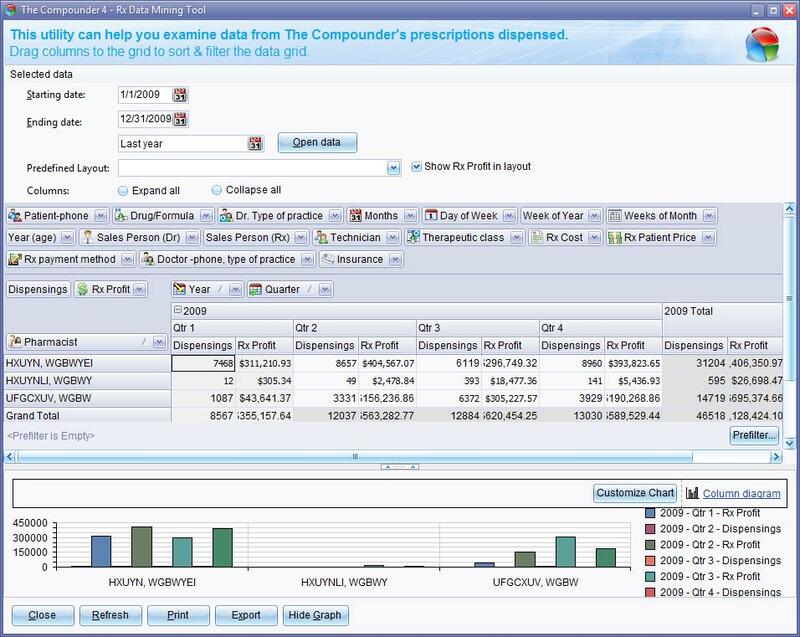 Perhaps you want to see prescriptions grouped by doctor and then by month or profit grouped by formula. Hierarchical Data Display: Search results are automatically arranged into tree structures with expandable parents. Expand or contract to see more summarized or raw groups. Automatic and Manual Totals: Each row or column amount is summarized and summed. Drag and Drop filtering: Visually build the result set you're looking for on the fly with an easy to use model. You must be running version 4.9.8 or higher of The Compounder. The data mining tool is automatically installed with the software. You need to purchase a license and register it through The Compounder. Click the "Contact Us" button at the top of this page if you have questions about how to download and install this module or if you need help logging into our website.